Singer-songwriter John Prine is an icon in the world of music, known and beloved by his fellow artists and acclaimed as the best of the best by knowledgeable listeners the world over. Prine was born October 10, 1946, in Maywood, Ill., to William Mason Prine and Verna Valentine Hamm, who had moved from Kentucky to get away from the mining life. Prine grew up in a music-loving family steeped in rich country tradition and blue-collar pragmatism. He learned guitar as a young teen from his grandfather and brother, and quickly began writing songs and setting them to music. “The first time I held down a chord and I didn’t muffle it, well, I just sat there with my ear on the wood even after the sound died, feeling the vibrations,” Prine says in a biography on his current record label’s Web site. Despite his love of music and his innate talent, however, Prine didn’t plan on a life spent on stage. He wrote songs just to have something to do or to impress girls, played them, forgot about them, and then wrote others. “I loved singing and I loved playing the guitar, but I didn’t think it sounded at all like people sound when you see them on TV or hear them on records, so I didn’t really put much hope in it,” he would tell journalist Alistaire Mabbott decades later. So Prine graduated high school, served two years in the Army (which stationed him in Germany), then came home and started work as a Chicago mail carrier. But one night, Prine’s destiny caught up with him during an open-mic at a local bar. One after the other, a string of talentless amateurs got up on stage, and Prine couldn’t keep himself from commenting on their efforts. A bystander challenged him to do better, and Prine got up on the boards and played three songs he’d penned: “Hello In There, “Sam Stone” and “Paradise.” When club’s owner offered him a singing job that same night, Prine set to work writing and composing, began performing around town, and soon garnered a local following. Before long, established music professionals Paul Anka and Kris Kristofferson heard Prine and were impressed with his sound. They arranged for Prine to begin singing at clubs in New York and Los Angeles, and helped him get his first contract with Atlanta Records, out of which came his debut album, “John Prine.” The album, which consisted of songs Prine had written and composed during his mail-route and coffeehouse days, drew wide praise from listeners and critics. Prine made four other albums with Atlantic and toured continually, appearing at clubs, in concert and at festivals around the nation. Audiences responded to Prine’s relaxed persona and the lyrics he wrote for the common heart. Stardom eluded him, but his loyal fan base kept growing. Later, Prine said he was grateful for never having been a superstar. “I always had a private theory that if you’ve never had a big hit, it’s hard to go out of fashion because you were never in fashion,” he told writer Rob O’Conner in 1999. His private theory pans out: Prine fans don’t consider him a treat; they consider him essential, a mainstay, a musical interpreter of their own life philosophies who steps on stage not as a show-business pro, but as a personal friend. Prine’s songwriting took him next to Asylum Records, where he released “Bruised Orange” in 1978, again to a chorus of praise for his folk compositions. His next album, the more rock-influenced “Pink Cadillac,” cemented Prine’s stellar reputation with serious folk, country, and rock aficionados. The album, wrote New York Times reviewer Robert Palmer, displayed depth of quality rarely seen in music of that time. Throughout his songwriting career, Prine’s fellow musicians have paid him the ultimate compliment, performing songs he wrote and in some cases making Prine’s songs their own signatures. 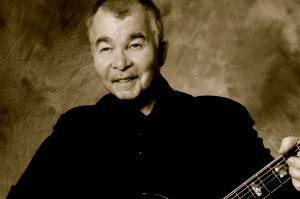 In this way, John Prine has touched countless more people than he, or they, can know. In the early 1980s, Prine, out of a record contract and not looking to assume another, started his own label, the Los Angeles-based Oh Boy Records, with Al Bunetta and Dan Einstein. Prine’s first independent effort, “Aimless Love,” was produced 1984. Prine’s next effort, “German Afternoons,” garnered him a Grammy nomination, as did “John Prine Live.” He finally won the coveted award in 1991 for “The Missing Years,” which featured guest appearances from Bonnie Raitt, Tom Petty, and Bruce Springsteen. He has produced or co-produced at least 10 of his own albums with Oh Boy. In 1996, Prine married Ireland native Fiona Whelan, whose heritage has led Prine to explore Celtic musical influences. Prine was still on a roll in 1997, when a diagnosis of cancer brought him up short. Prine, who had been a heavy smoker for 30 years, noticed a lump on the right side of his neck in 1995. The following year, Prine mentioned it to a doctor, who waived off his concern. But a year later, Prine decided to have the painless lump removed. A standard pre-surgery biopsy revealed that the lump was a squamous cell carcinoma. Prine underwent surgery in January of 1998 to remove the tumor. He then endured six weeks of radiation therapy. Doctors initially sought to shield Prine’s vocal chords from the radiation, but Prine would have none of it-his focus was more on beating the cancer than preserving his voice. A year later, Prine wrote a letter to his fans that was characteristically frank and wry. When Prine resumed touring and recording, critics would notice a deepening of his vocal timbre that hadn’t affected the quality of his delivery. Prine had an adoring audience “eating out of his hand” at a September 2004 concert in Santa Cruz, Calif., according to Santa Cruz Sentinal writer Wallace Baine. Prine was back in his element and back in top form, leading the life he was born to-and showing the world that a joyful life is possible after cancer.